Image caption Twitter users asked if the driver would be "facing the long arms of the law"
A driver who swerved "to avoid an octopus" before crashing has been arrested on suspicion of drug-driving. Police were called to the A381 between Malborough and South Milton in Devon, where they found a vehicle upside-down in a ditch on Tuesday evening. The 49-year-old driver was checked over by paramedics before being arrested. 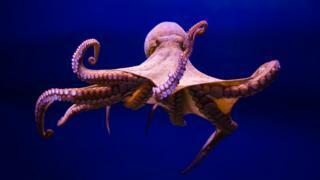 Officers, who tweeted about the incident, said they found no evidence of an octopus on the road. Octopuses are not unheard of in the seas off the south coast of England, but this particular cephalopod would have had to crawl more than 3 miles (5km) over hills and fields to find itself in the path of a car on the A381. A spokeswoman for Devon and Cornwall Police said: "He did a bit of a slow roll into a ditch. "An ambulance went out and the driver was checked over by paramedics but there weren't injuries enough to go to hospital." The man, from Salcombe, was arrested on suspicion of driving while unfit through drugs or drink and has been released under investigation pending further inquiries. Twitter users were quick to respond with puns. However, police pointed out that driving under the influence of drugs - illegal or prescription - was a serious matter, and could be "just as dangerous as drink-driving".